As you peruse your e-mail on your laptop, you read messages, reply to messages, and then click the Send button to send those messages. But rather than cause your e-mail program to dial in, connect, send, and then disconnect over and over, you should send all your e-mail messages at one time, in a single batch. 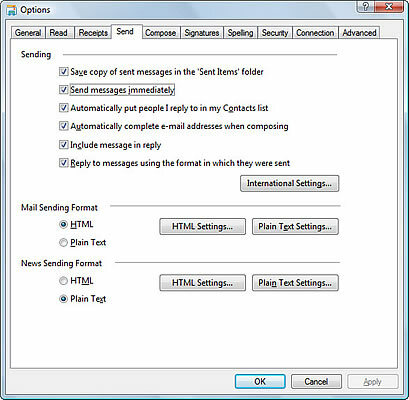 In the Options dialog box, click the Send tab. 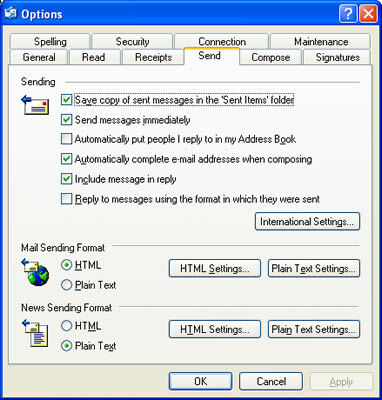 Deselect the Send Messages Immediately check box. The messages now sit in the Outbox and wait until you connect again. This option can help both dialup and broadband users. Obviously, for dialup, it allows you to save time by sending all your outgoing messages at one time.